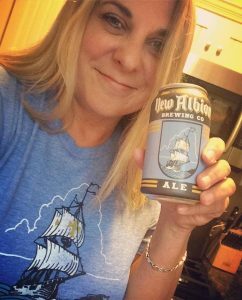 I’m Renée M. DeLuca, daughter of pioneer microbrewer Jack McAuliffe, the founder of the New Albion Brewing Company. In 2013, Jim Koch and the Boston Beer Company revived Jack’s flagship brew, New Albion Ale, the first American Pale Ale. We are now brewing New Albion Ale with Platform Beer Company in Cleveland, Ohio! You can find it in their taproom and wherever else Platform distributes! I was raised in Maryland, and lived in the Cleveland, Ohio area for more than 30 years. Today I’m in Raleigh, NC, and loving life in this beery Southern state. The craft beer scene here and across the country has exploded, and it’s all because my father had a great idea for brewing and distributing flavorful beer made in small batches. You can find me on Facebook and on Twitter @brewersdaughter, or email me at [email protected] Cheers! Not sure if you’ve been or heard about us but worth a look see! FYI, I remember GLBC from the mid-80s when their slogan/tag line was “Beer so fresh you can slice it”! Thanks for stopping by my blog! I have heard great things about Jackie O’s –I would love to come down and have a beer with you! I’ll keep you posted on any chance of my getting down that way. And I look forward to you coming for a visit to the CLE! I write for Currents and am putting together a story on seasonal brews, ales and wines for our November issue. I would love to get your input and will be happy to give your business a plug as well (by the way, we have a mutual friend in Julie Hanahan). Awesome blog Renee! Thank you for such a cool perspective & carrying on the legacy! Too bad I didn’t know of your visit to Wash DC earlier. I would love to have suggested a quick stop to one of my favorite breweries, Lost Rhino. It is in Ashburn, Va about five minutes from Dulles Airport. A great little brewery. They have beers from 2.5 to 11% alcohol. Of their fifteen beers, two of my favorites are Ice Breaker, 9.2%, and Face Plant, 6.2%. Both are IPA’s and creamy. If you are in the area again, you might try to stop by. Their web site is http://www.lostrhino.com. I had some Lost Rhino beers when in town, very.good! Cheers! Just read the businessweek story about your dad and Mr Koch working with you to revive the beer your father started. Great story … I hope you continue to embrace it and create a nice legacy for you and your family. I just wanted to say that I am fascinated by your story and the rebirth of your father’s brewery. I work as a beer educator and have been familiar with New Albion for several years. I am glad to see your dad getting the recognition he deserves and am thrilled to see New Albion resurrected. Thanks, Cliff. Nice to hear from you. Cheers! Renee, hi. Really like what you’re doing here. Any chance you’ll have any Brewzilla tix to give away this year? Yes, I hope to have some, stay tuned! Just came across your blog today… Love It! Great to see a local Clevlander with a rich history and passion for micro-brews. 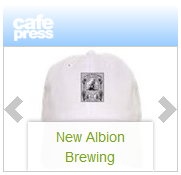 Good luck with the New Albion/Mendocino brewing partnership. Cheers! I’m happy to see that New Albion is making a comeback. I did the original labels for Jack in Sonoma. Say hello to him for me. Praying for good days and an earthly healing. I have also been looking for your father as I too graduated from West Nottingham Academy in 1963. We kept in contact for a year or so and than he disappeared. I also was friend with Linda and also kept in touch were her for several years when I lived in Arlington, VA.
Glad to see that both you and he are doing well. My name is Nick Bockanic and I work for a marketing and publicity agency that handles major motion picture clients including Lionsgate Films, Sony Pictures, and Warner Bros. Pictures. Lionsgate has a new movie coming out called GODS OF EGYPT starring Gerard Butler and Geoffrey Rush. We’re looking to work with bloggers around Cleveland to help promote the film through a couple posts on Twitter and/or Facebook. Ancient Egyptians were one of the first known cultures to make beer and since your blog is all about beer, a fun promotion could be sharing a couple facts about ancient Egyptian beer. I can supply you with all the information you would need and I can also write out sample posts for you to review. We are also hosting a free advance screening of the movie and I would be happy to reserve seats for you and anyone you would want to bring. Please let me know what you think and I look forward to hearing from you. I am jack’s 1st cousin, his father and my mother were siblings. if you are interested in family history, contact me. I tried to send you an email to the address you listed in your bio but it bounced. Is there another email address that I can reach you at?